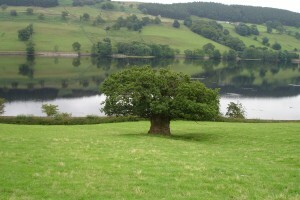 Upper Nidderdale is home to a wide variety of nationally and internationally important habitats and species. The high heather moorland with its pockets of blanket bog, combined with rare upland hay meadows in the dale bottom, support significant upland breeding bird populations. Land use is predominately livestock farming in the dale bottom, with the moorlands managed for grouse shooting alongside extensive grazing. Upper Nidderdale’s habitats, and the species found within these habitats, are linked directly to the underlying geology, historic and current land use. Upland heathland supports a variety of habitats and species from heather managed for raising grouse for shooting, to areas of blanket bog, which support hosts of insects and other invertebrates which provide food for ground nesting birds. Below the moorland line, most of Upper Nidderdale is grassland, although woodlands and water also form important habitats. The moorland fringe marks the transitional zone from moorland to more heavily managed in-bye land. This contains semi-improved grassland and rough pastures support high numbers of invertebrates, and the wetness and structure needed by upland wading birds such as redshank, curlew and lapwing. Over the last 60 years, most of Upper Nidderdale’s wildflower-rich meadows have been lost. However, the small numbers that remain are able to support a wide range of species of wildflowers and other plants. These plants attract many different kinds of insect and these, together with plant seeds, provide food for birds and small mammals. The small areas of carboniferous limestone in the dale support upland calcareous grassland. Within this habitat are patches of calaminarian grassland which grows on the waste from the once extensive lead-mining industry centred on Greenhow. These spoil heaps support a range of rare heavy metal-tolerant plant species such as alpine pennycress and spring sandwort. Most field boundaries within Upper Nidderdale are dry stone walls; however some hedgerows remain, particularly around Pateley Bridge. These provide important mini habitats and provide corridors for small mammals and birds to move through in safety. The standing water of Upper Nidderdale’s three reservoirs is unusual in the Yorkshire Dales whose underlying limestone geology means that there are few natural lakes. All three are important for birdlife, particularly for migrating ducks and geese.